When I was still doing nutrition coaching, I was often asked by my clients how I managed to be so creative in the kitchen. They’d tell me how hard it was for them to come up with new, inspired recipe ideas, and describe how easy it was to fall into a routine of the same foods, day in and day out. The honest truth? I’m not always that creative. Like everyone else, I fall into ruts. This isn’t necessarily a bad thing—there’s a lot to be said for simply listening to your body, and, if it requests favorite staples, giving it what it asks for. But I also love to create new and unusual dishes, and as a student, I’ve had little time and energy for it. Thankfully, I was given a new raw cookbook last week that is stoking my creative culinary fires and getting me back into the kitchen. It’s all thanks to Judita Wignall. Judita has been blogging for as long as I have (maybe longer?) and I’ve actually met her in person; we were both eating at Pure Food and Wine on the same night a few years ago! I have always admired the beauty of her food and her cheerful approach to sharing it. She always seems to be beaming with enthusiasm. See? 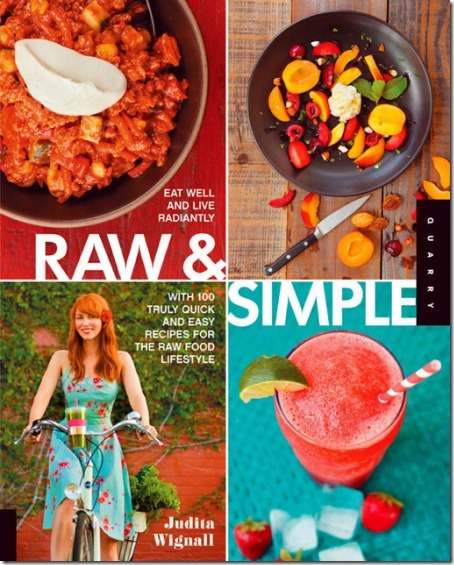 Judita is already the author of one book, Going Raw, which is a wonderful introduction into the raw foods lifestyle. Her new book’s theme, however, appeals to me even more. It’s titled Raw and Simple, and the goal of the book is to present quick, easy, and low prep raw recipes. 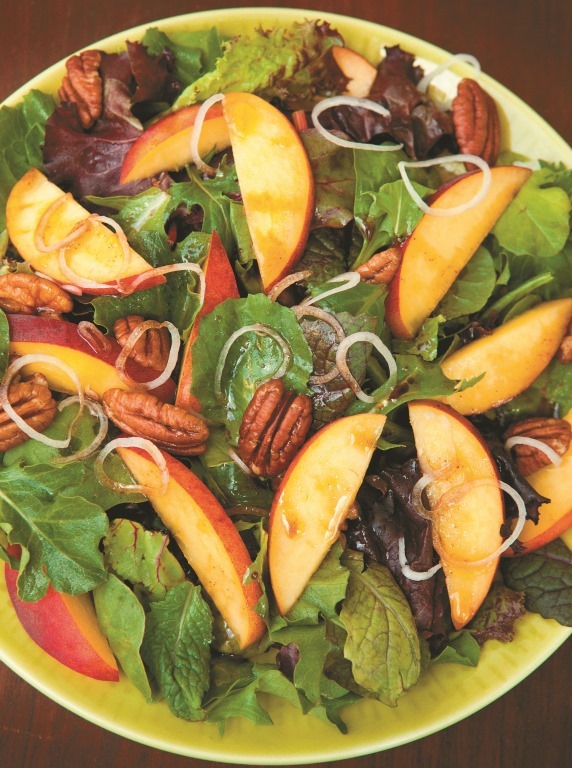 The focus is smoothies, blended soups, salads, and basic entrees. I’ve always been a “low-prep” raw foodie, but my post-bacc has made me even more drawn to recipes that feature simple ingredients and preparation methods. The clean, streamlined ethos of Judita’s new book appeals to me tremendously. It’s worth noting that not all of the recipes are vegan—some do contain honey—but the vast majority of them are, and it’s more than easy to replace the honey with maple syrup if you don’t consume it. Judita and I share a love of raw soups, avocados, leafy greens, and chocolate. We also share an appreciation for raw foods that doesn’t veer into fanaticism or preachiness. 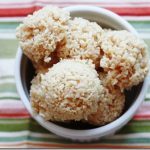 Judita demonstrates her love of raw food through sharing recipes that she has clearly developed with love—not by pounding you with health factoids or dogma. 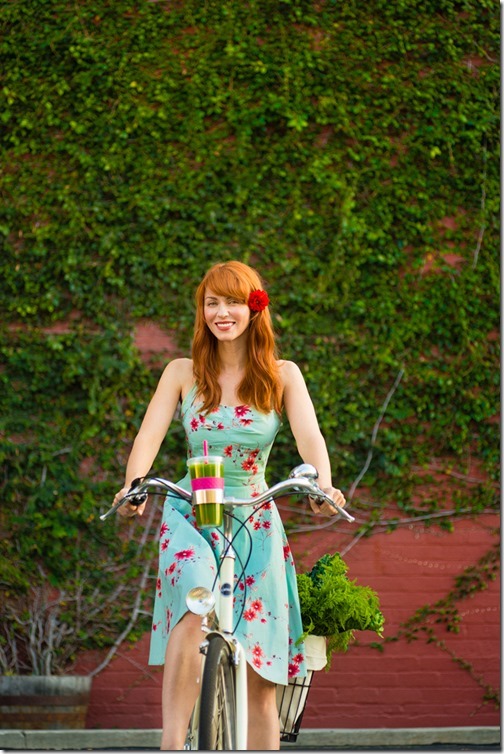 I think she is the most effective and appealing kind of raw foods spokesperson! The book is also full of really beautiful photography and clear, concise instructions. A few of Judita’s basic tutorials—for example, how to make coconut water kefir—are really helpful, and have inspired me to get a little more DIY than I have been lately! It was very hard selecting a recipe to share with you guys—as you can see from the photos above, there were so many beautiful ones to choose from. 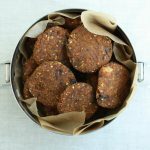 In the end, though, I wanted to give you an example of the kind of quick, easy, yet absolutely delicious treats Judita is so talented at creating, so I’m sharing her recipe for walnut oatmeal raisin cookies. 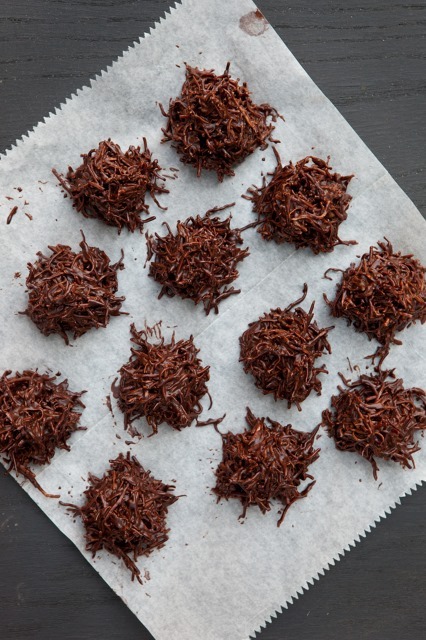 They take only minutes to prepare, and they’re totally addictive. 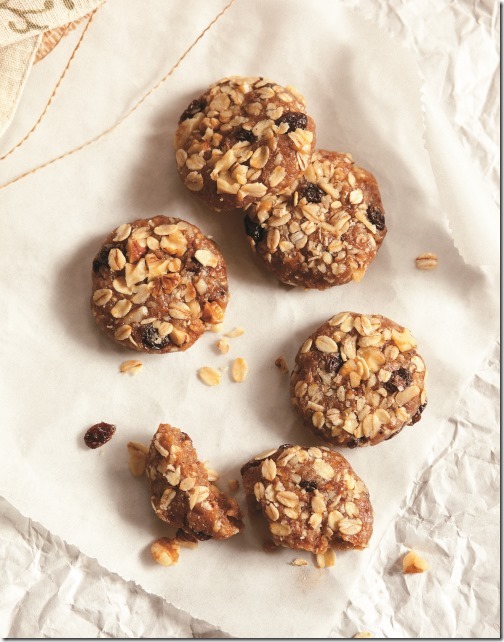 Oatmeal Walnut Raisin Cookies by Judita Wignall. © Raw and Simple, Quarry Books, 2013. Make sure there are no children in the room when you taste these chunky, chewy cookies because you might start cussing at how incredibly tasty they are. Or am I the only one who swears like a sailor when I eat something crazy good? Put the walnuts into a food processor and process until they almost turn into walnut butter. Add the dates and process again until it becomes doughlike, then add oats, vanilla, cinnamon, and sea salt and process until well incorporated and doughy. Transfer the mixture to a bowl and stir in the raisins. Take one heaping tablespoon of mixture at time in your hands and shape into twenty balls. If your mixture isn’t sticking together, sprinkle it with two teaspoons of water. Spread chopped walnuts and oats onto a clean surface work area. Press the balls into the chopped walnuts and oats and shape into cookies. Chill the cookies in the freezer for a chewier texture or in the refrigerator for a softer cookie. Store in an air tight container in refrigerator or freezer for one month. Yum! I hope you’ll all check out the cookies, and, more importantly, that you’ll check out Raw and Simple! A really great raw foods primer. Have a great evening, friends. Tomorrow, the tempeh tutorial I have long alluded to! 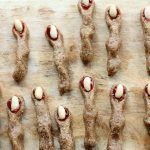 I just whipped these cookies up as an after school snack, and they were fabulously addictive! Thanks for sharing. You are definitely my number one raw food and compassionate lifestyle inspiration, but I am eager to check out Judita Wignall’s book. She sounds like my kind of girl! Also, I just bought tempeh for the first time, so I am totally looking forward to your tutorial tomorrow! Am I the only one who suddenly wants long red hair? Seriously though, great pictures. I have a philosophy that most people eat relatively the same things in rotation but we all look for fun and easy ways to change it up sometimes. Thanks for sharing. And some of just want hair. Period. The cookies look great. Just wondering though if the rolled oats are raw? Not technically — they’re almost always flash steamed. But they don’t undergo significant nutrient loss. I prefer the word “groove” to the word “rut.” Being in a rut implies we’re stuck, desirous of change but unable to summon the wherewithal to extricate ourselves. Being in a groove is very different. 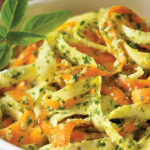 I think that it’s hard to be always on in every area of our lives, and while I know you appreciate the opportunity to create recipes and explore new techniques and flavors, it’s great that you have found a healthy groove to return to when there are other demands on your time and creativity. I like this twist! It does feel nice to find a rhythm that works. wow, looking her up for sure! 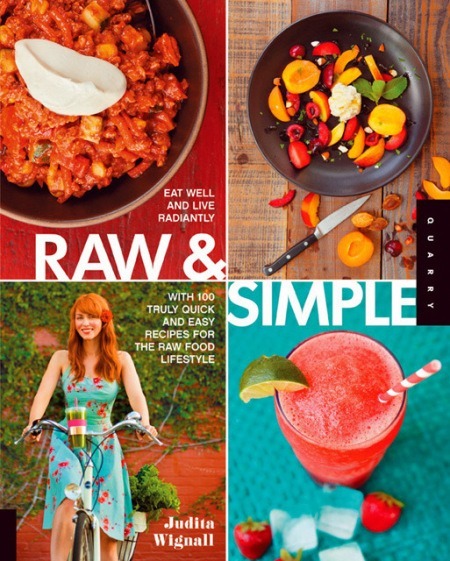 Judita (and the book) are gorgeous… I’m always looking for simpler raw recipes, and would love to incorporate more. Thank you for posting the review Gena! Wow! 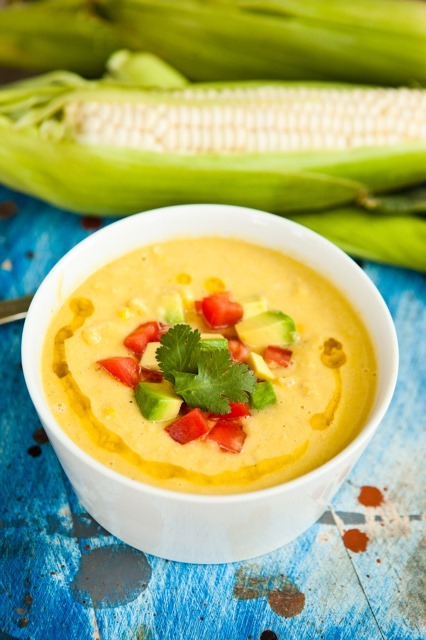 That corn chowder looks amazing! I’ve been doing a mostly raw cleanse for the past few days, and I’m on a glorious cooked foods retox today (I swore I never wanted to see a raw veggie for days!). But I think I’d even go for that raw chowder right now. Those cookies are on my list! They look like an amazing way to test out my new food processor. Dates killed my last one, so I’ve been a little leary, but I think it’s time to bite the bullet. I love Judita, and her new book! Thanks for the reminder to try these delectable-looking cookies. I can attest both books are just lovely and should be in any vegan/raw foodist library. 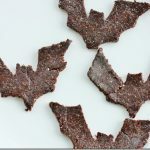 The recipes are simple yet creative, and a big plus is they are not heavy on using a dehydrator (I don’t own one – yet!). I also took her introduction to raw foods class last year locally. It was such an eye-opener, and her approach was so warm and friendly, everyone left feeling very inspired to try more raw foods. Again, you will enjoy both books!! You don’t have to be vegan to love these cookies! I am not, but several of my nearest/dearest are, and I made these for a vegan dinner party last night. They were a big hit. Thanks for sharing the recipe, Gena. Thank YOU! Glad it was a hit. Thank you for your review and share! I noticed that you didn’t use sugar in the oatmeal cookie recipe. What would you add as a sugar substitute for those of us who like our cookies extra sweet? I would use some agave or coconut sugar, Alana! I also like maple syrup.